This is was a busy week. Looks like this will continue for another two weeks. We are going to Chennai India for a week. No stitching possible during that time. I think I finished my monotone project on sumptuous surfaces class. I haven’t started long tail chain stitch sampler on TAST yet. I worked a spray and seam on my crazy quilted hussif 1. Floral spray detail, beads will be added later. 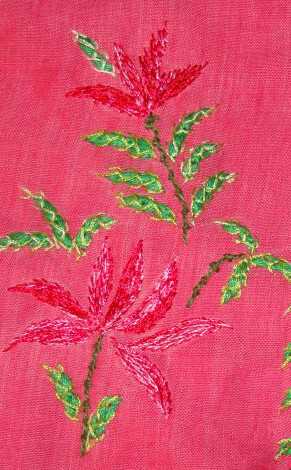 The leaves are made of feather stitches worked over chain stitch [cotton skein] in silk thread. 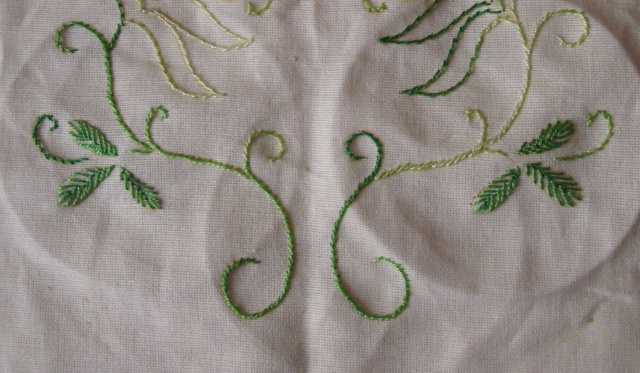 I had seen feather stitches worked over satin stitch, this is modified inspiration. 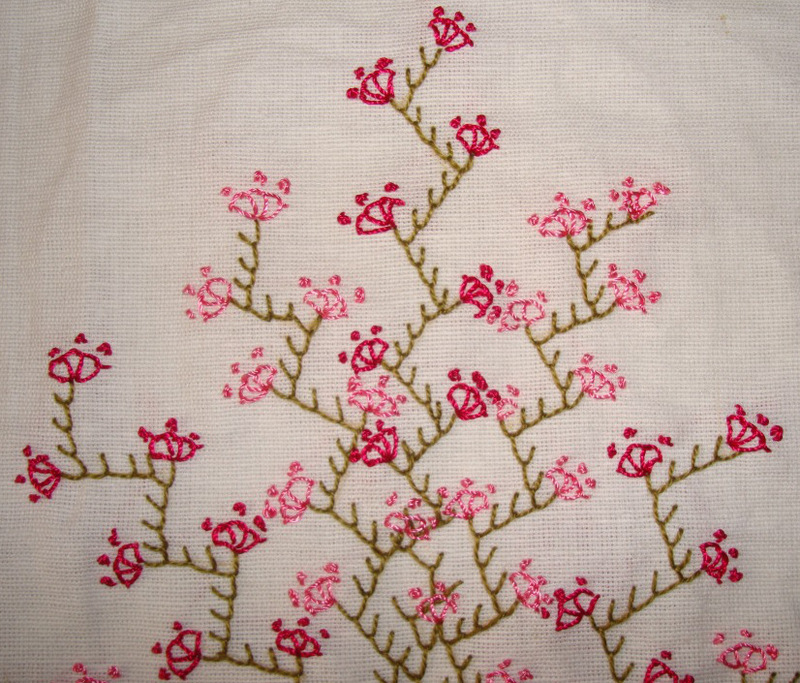 Seam has fly stitches worked over detached chain stitches. Pop in to Sharon’s blog to see others progress. 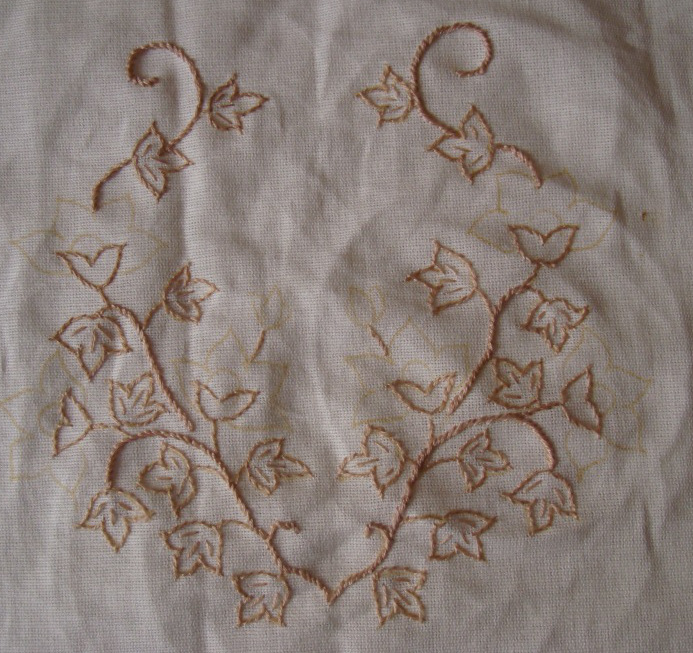 Started with stem stitching the leaves and working straight stitches in two strands of cotton skein. 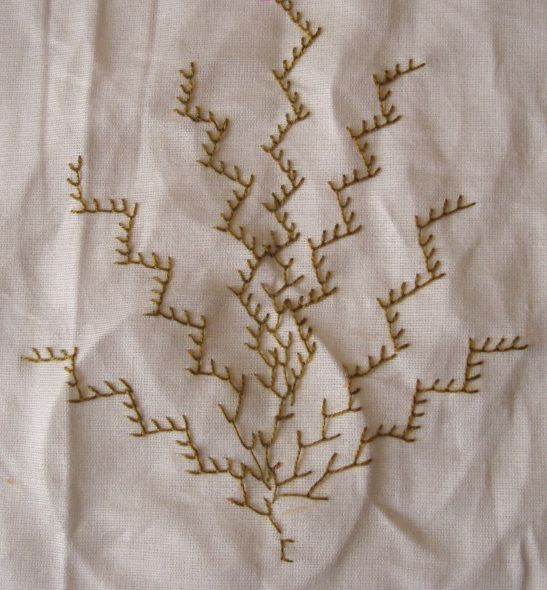 Four strands of thread are used for the thicker stem stitches on the stems. 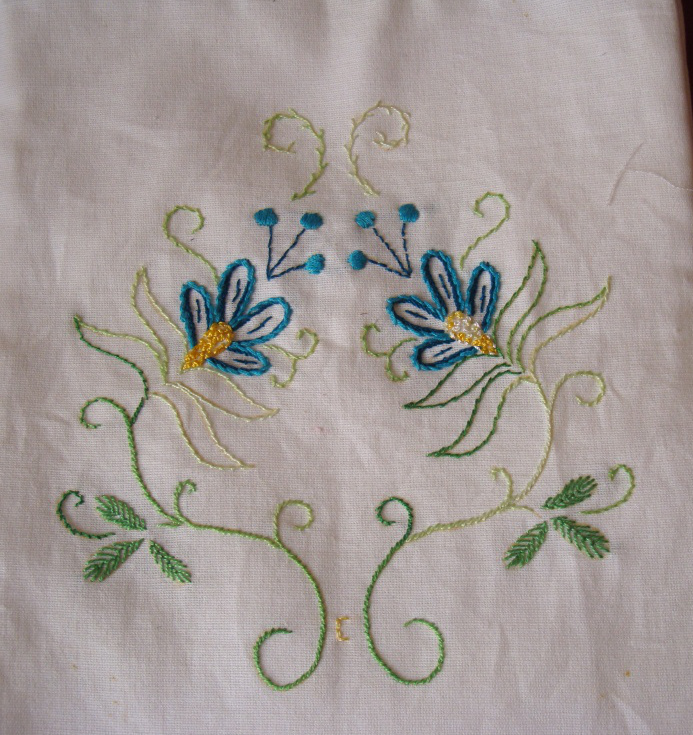 The flowers are outlined with buttonhole stitches. 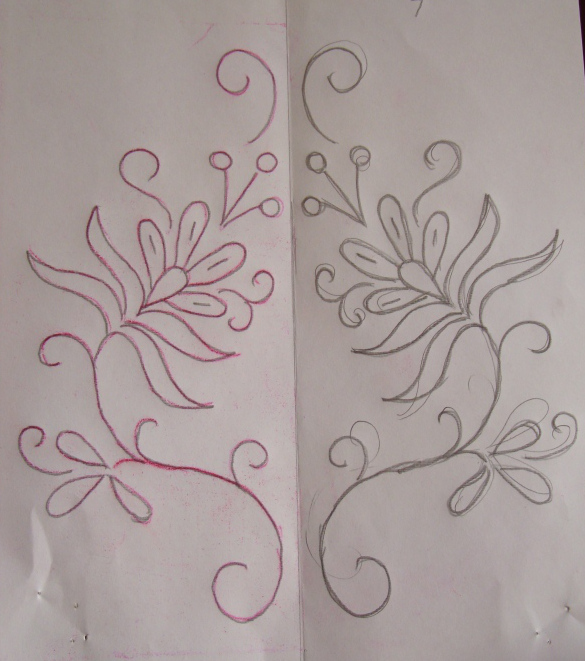 A few more possibilities of working beaded feathered chain stitch are explored. After working the long tailed chain stitch, a straight stitch was taken to work the bead, before working the next chain stitch in the first sample. The same treatment is repeated in the opposite direction with three beads in the second sample. 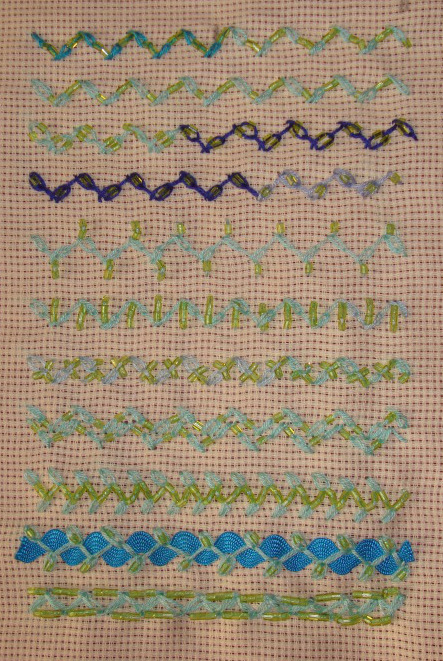 Two straight stitches with beads, perpendicular to the long tailed beaded chain stitch with bead is repeated in the third sample- an interesting beaded version. 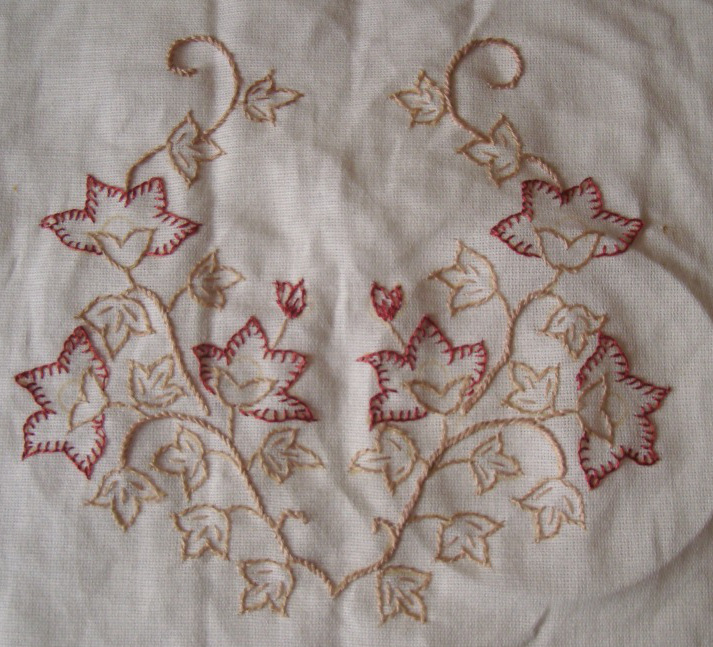 Two rows of this stitch are worked together in the fourth sample. I worked the other version of feathered chain and added two beads in the first sample. 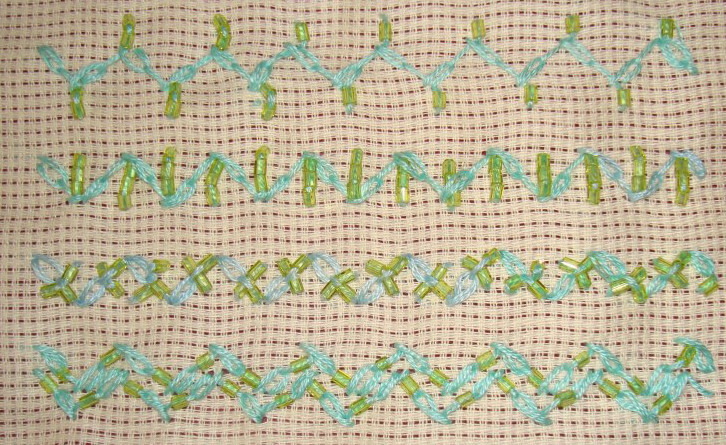 Ricrac is couched with this version of the stitch, with beads inside the chains in the second sample. 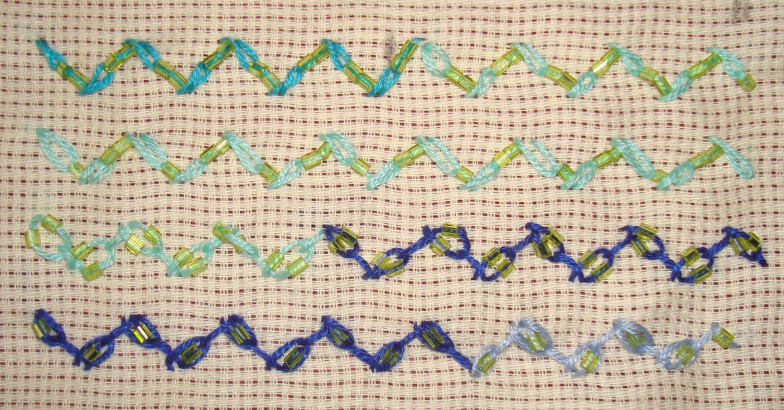 Beads are worked on the closed feather stitches worked after the zigzag chain in the last sample. I tried this version with some variations on feathered chain stitch sampler. The beaded feathered chain stitch sampler. 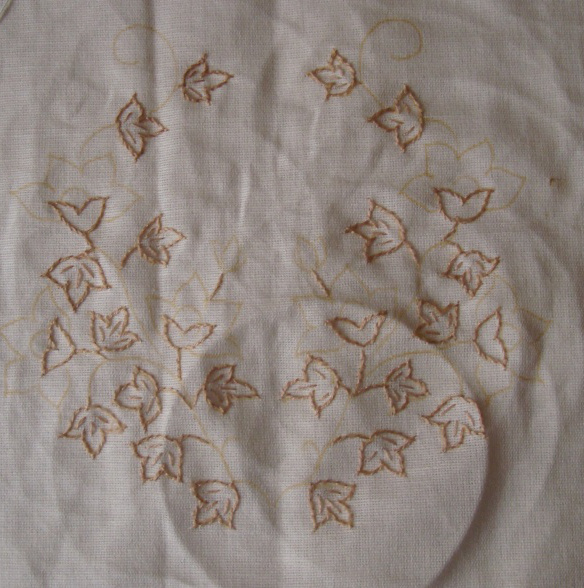 I am still floundering on my exercises on the sumptuous surfaces class, so did not explore the possibilities of this stitch much. This is the first time, I am designing a hussif. I have not designed any fabric piece before. This is a small hussif-12 by 8 inches. Let me start with simple steps. 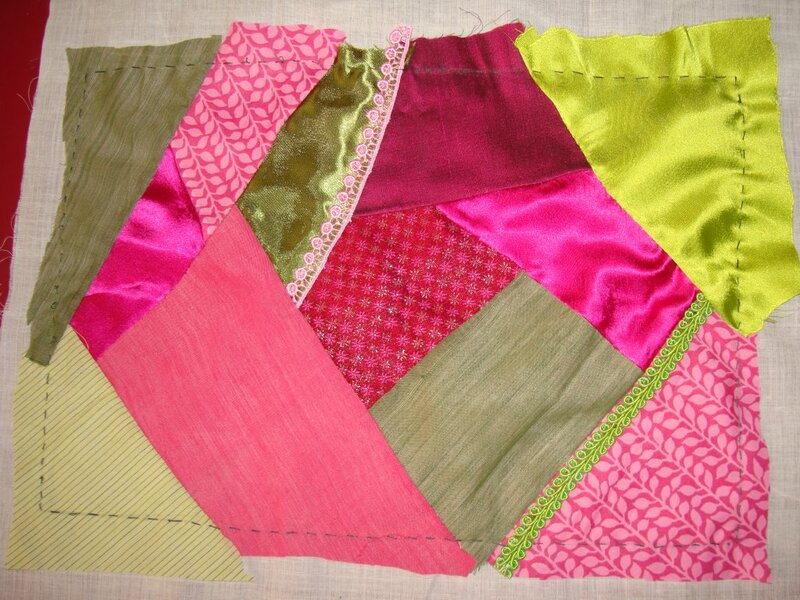 The encrusted crazy quilting class lessons are very useful. 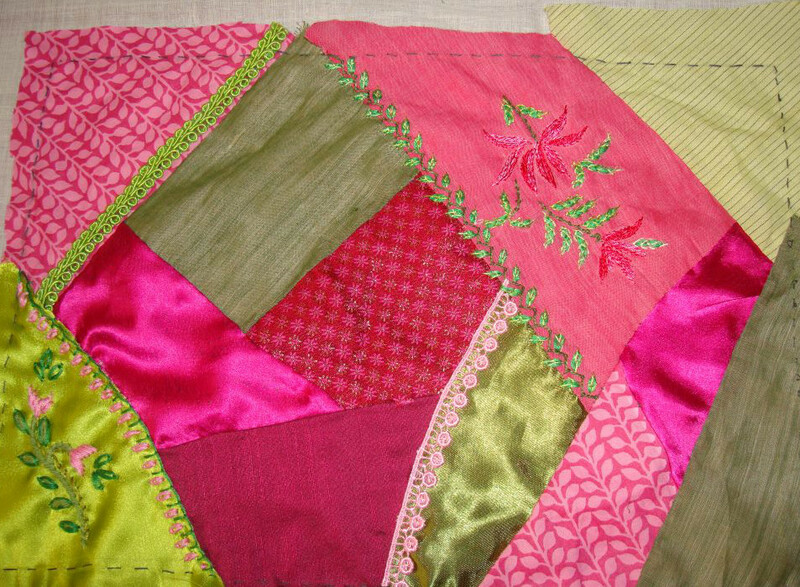 That’s reason, I am working crazy quilting this hussif, to practice. I have not made any arrangement for my sewing machine. This hussif is pieced by hand! I am learning new things on my sumptuous surfaces class. This week’s TAST stitch sampler is growing very slowly. 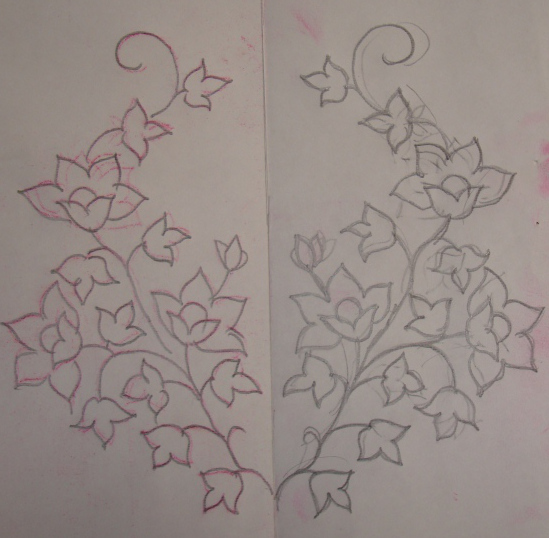 I worked a floral spray on this block, the beads will come later. 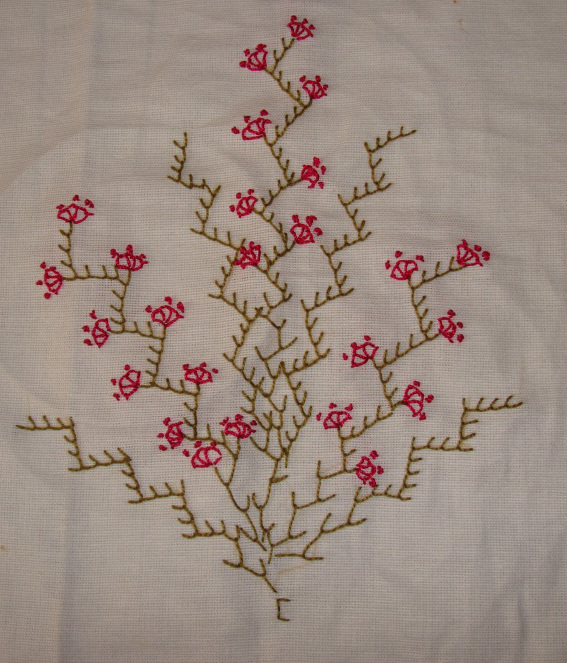 I started with rope stitch for the stem, berry stitches for the big leaves, detached chains for the smaller leaves, satin stitch for the flower and ended the spray with straight stitches along the stem. 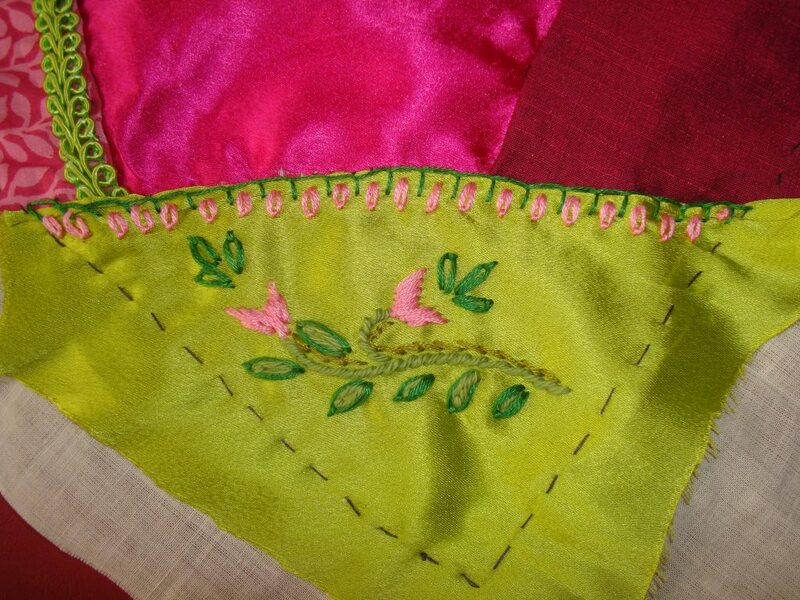 The seam is made of buttonhole stitches and detached chain stitches. 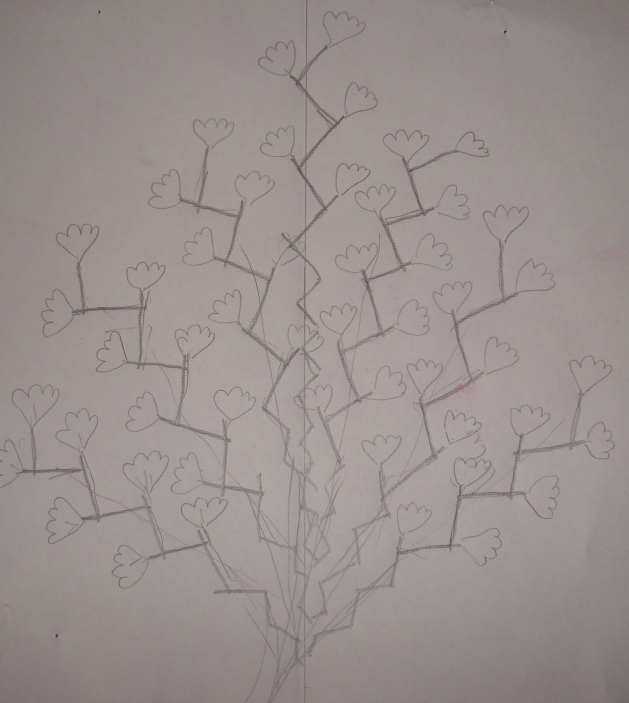 you can see others progress on SharonB’s blog. I started on this stitch sampler today. The working is on SharonB ‘s blog. 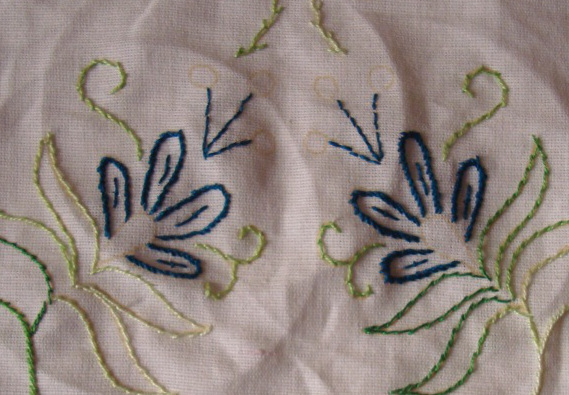 The basic feathered chain stitch with two beads is worked in the first sample. Single and two beads are alternated in the second sample. 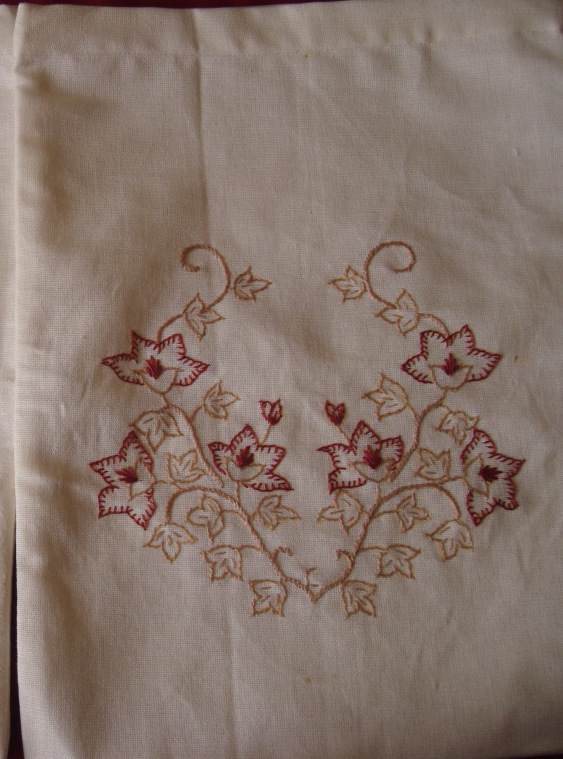 Two beads are worked into the chain stitches in the third sample. 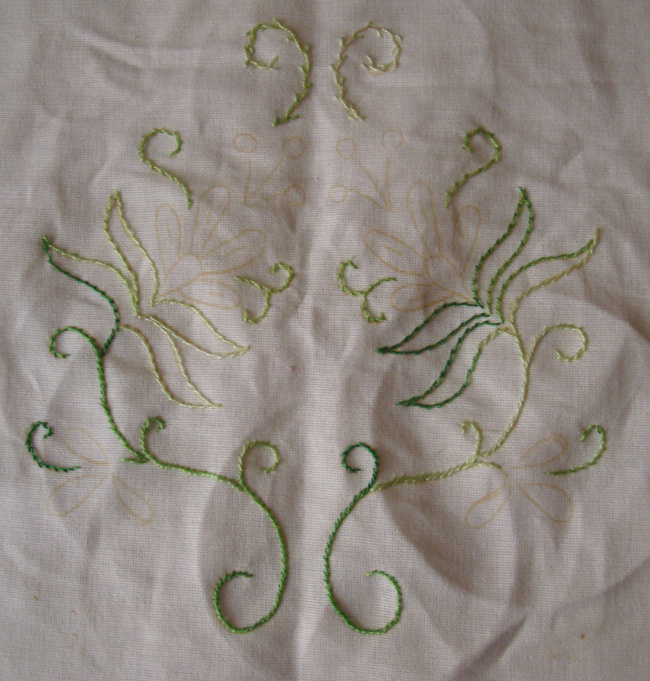 the chain stitches are worked over the bead in the fourth sample. I started working this week’s stitch on TAST challenge beaded feathered chain. This bag is the third one I made. 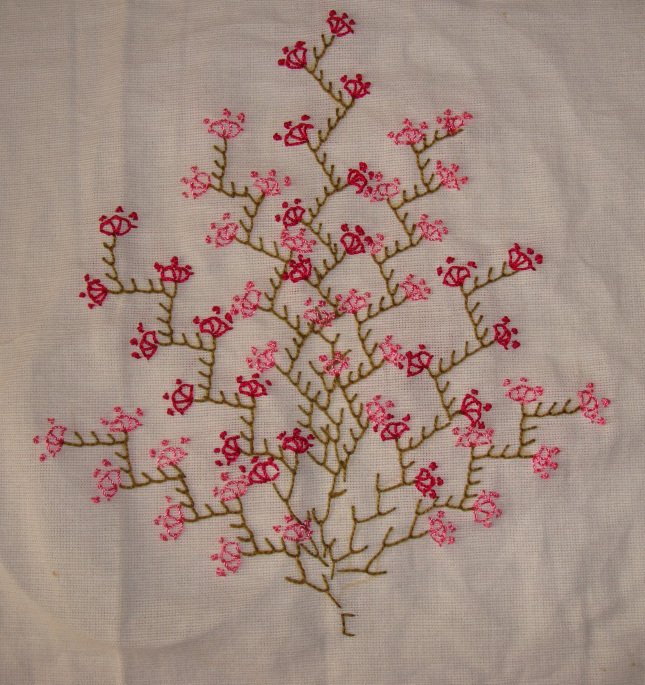 The embroidery was very simple. The pattern to work the feather stitch lines. 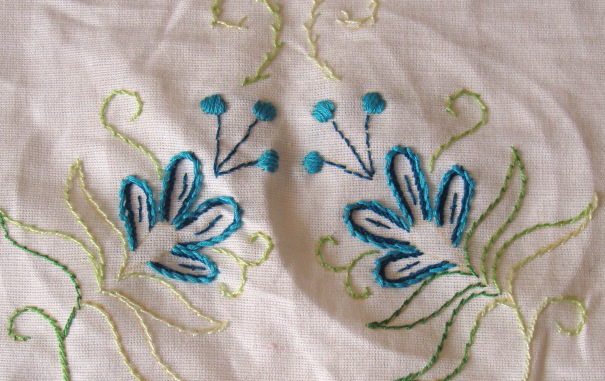 The feather stitches worked in perle cotton # 8. Except for changing the threads, the work was easy and quick.